National Football League star Michael Vick has handed himself in to US authorities to begin a jail term for his part in a dog-fighting ring. 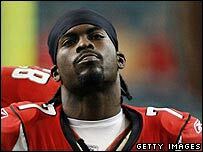 By voluntarily beginning his sentence early, Vick hopes that his jail term will end earlier, according to reports. District Judge Henry Hudson is set to decide on the length of Vick's sentence on 10 December. He could face up to five years in prison for the crime, although he is more likely to serve 12 to 18 months. In August, Vick pleaded guilty with three others to running an interstate operation known as Bad Newz Kennels from 2001 to April 2007. Prosecutors said the dogs sometimes fought to the death and underperforming animals had been shot, drowned, hanged, electrocuted or killed by being slammed to the ground. In a news conference after his court appearance, Vick promised to redeem himself. "I want to apologise for all the things that I have done and I have allowed to happen," he said. Vick, 27, signed a 10-year $130m (£65m) contract with the Atlanta Falcons in 2004, but has now been suspended indefinitely without pay by the NFL.